In front of a big Beaverton homecoming crown hoping to see their Beavers build on a three-game win streak, Sunset's ferocious three-headed, three-pronged approach spoiled the festivities before the king and queen could even be announced at halftime. Led by their increasingly confident quarterback Callum Craig and a mingy defense that's starting to get its just due, Sunset scored 30 unanswered points in the first half and never looked back, wheeling to a 54-21 road win at Beaverton High School on Friday night. All three phases of the game played a role in the rout. Craig was dialed in all night, conducting an offense that saw six different players score touchdowns including running back Kadin Williams who had two of them on the ground. Defensively, Sunset won at the point of attack with monsters like trenchmen Hunter Newcomb and Ike Nguamo making a living in the Beaverton backfield. Their athletic defensive backs like Nick Halvorsen and Nate Archibald blanketed the back end. The all-important special teams units were vital in the field position battle and limiting Beaverton's detonative playmakers. It was superior complementary football. "It felt like we were all clicking as a team," Newcomb said. "Overall our confidence is great because we know we can all rely on each other. It gives us trust in each other that we know we can get the job done." 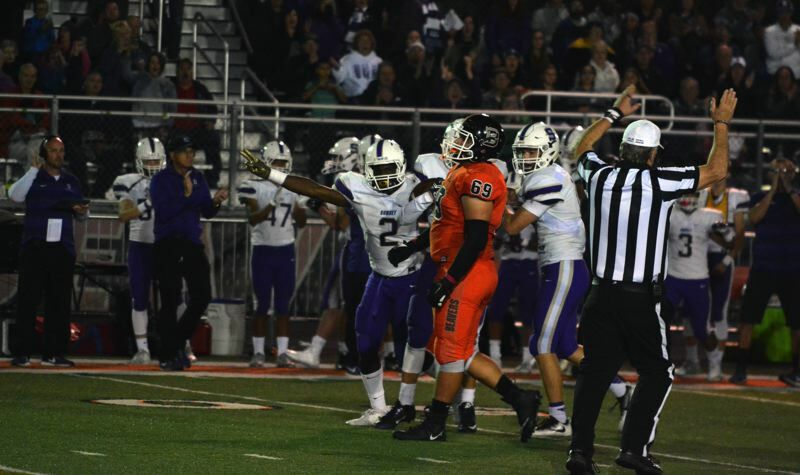 All-around, it was the sort of bell-answering, prototype performance the Apollos (5-2 overall, 3-0 in Metro) can take pride in and better yet use as the blueprint with a de facto Metro League championship game at home against Jesuit coming up next week. "This was an example of how well we can play when we all play well together," Craig said. "Now, this is the expectation of how we should play all of the time." 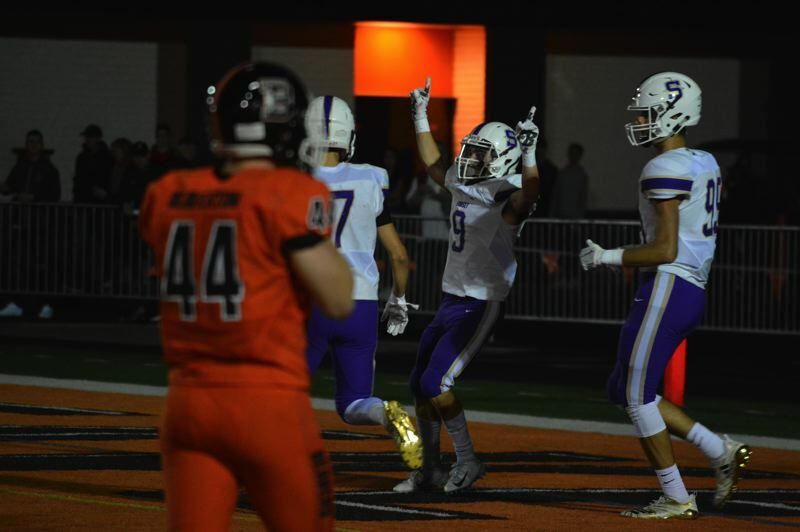 Maybe Beaverton got too caught up in the week-long homecoming revelry leading up to Friday or started looking too far ahead to its own regular season showdown with Jesuit. 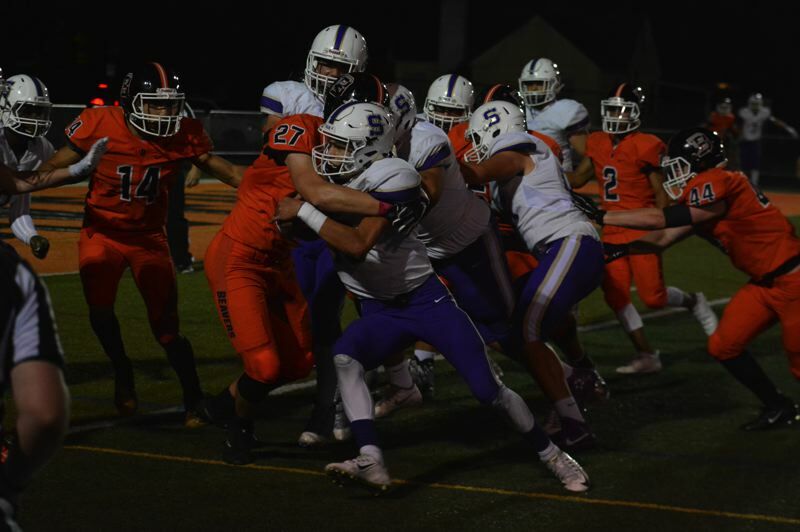 Whatever the case, junior defensive end Sandrey Mitberg said the Beavers' practices this week were sub-par, to say the least, and led to the flat, rather surprising 33-point rout on their home field. "Sunset played very well, but I think we would've had them if we had been more committed in practice," Mitberg said. "Practice is everything. If you take a rep off of the simple stuff, it makes a massive difference. You go slow on a route in practice, you'll do the same in a game. You jog instead of sprint during practice, it shows on Friday nights. The small stuff matters. I know I'm going to have to get on some guys and call some guys out. But, it's just going to make us better as a team." The Beavers started out rolling. A big kickoff return by Ethan Wilborn set Beaverton up with a short field. Quarterback Carson Budke and company turned that into a seven-play, 66-yard scoring drive on the game's first possession that included a fourth down conversion from Budke to Trent Walker on 4 and 7 and finished off with a Budke two-yard keeper. But Beaverton was hushed the rest of the half by an Apollo team that played its best game of the year. 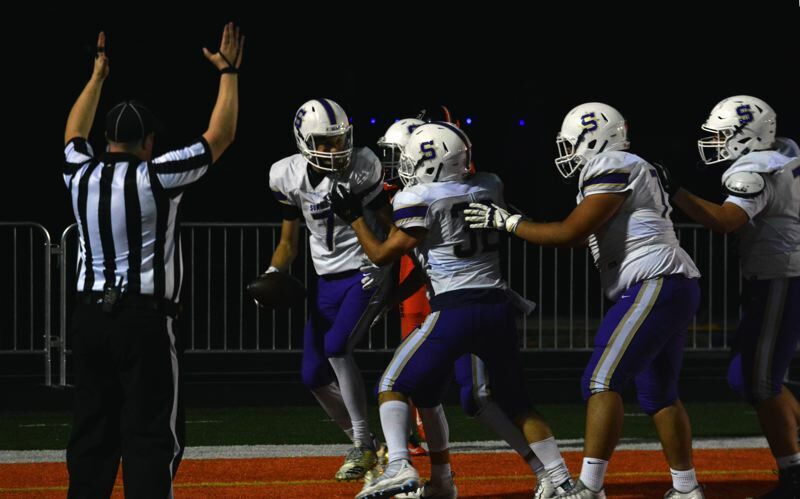 The humbling homecoming, however, might get the Beavers back on track as it prepares for crosstown rival Southridge next week. Better to get a wakeup call now than in three weeks when a loss in the playoffs will result in early extinction. "We were just unfocused," Mitberg said. "A lot of our guys didn't expect Sunset to be that good, which I don't really understand. But next week should be better. Everybody should be pumped up for Southridge. We can play so much better than we played tonight and we will. I know the coaches are going to hard on us this week, but it's what we need." The first half was a sterling symbiotic performance on behalf of the Apollos. On offense, Craig and his crew of wide receivers were terrific, connecting on critical third-down passes, extending plays when the first or even second pass-catcher wasn't open, spreading the ball around to Archibald, Halvorsen, Williams, Trey Marchesi, Marve Nyembo, Jake Eilers and Nick Niedermeyer. Craig found four different receivers for house calls: Marchesi (60 yards), Archibald (10 yards), Niedermeyer (12 yards) and Nyembo (eight), putting balls on the money all evening long. Sunset's cache of playmakers didn't drop a pass. They were exacting and precise in their route running and handsy when the ball came their way even if the Beaver secondary was glued to them. "Every person in our offense can make a play and score a touchdown," Craig said. "That's what we pride ourselves on, being deep and being able to throw the ball to anybody, run the ball with anybody and make stuff happen." "(Craig) is feeling the offense, getting his reads right, getting more comfortable," Newcomb said. "We're starting to understand where we are as an offense." Craig is a freaky athlete, the kind of magician who pulls huge chunk plays out of thin air with his legs and electric right arm. But with each game, he's growing more and more secure with offensive coordinator Dominic Ferraro's four and even five-wide spread scheme that's as much about sensibility as it is speed. If his first receiver wasn't there, Craig didn't panic and take off as he might earlier in the year. He stayed composed in the pocket, surveyed the field, bought time if needed and his receivers stayed alive long enough for the signal caller to hit them in stride. "I probably relied on my athleticism too much in the beginning of the year, but now I'm starting to find that even balance of being able to extend plays and stay in the pocket," Craig said. "My line was giving me time and my receivers made some crazy catches. That's all them and the work they put in. They made it easy for me." The Apollo defense was stellar. Newcomb and Nguamo were a Beaver-bashing tag team, bullying into the backfield for a pair of huge tackles for a loss on third and short —one that led to Williams touchdown run and the other that proceeded into a blocked punt that Newcomb got his big right paw on. And in true balanced football, Craig cashed in the special teams highlight, hooking up with Nyembo on an 8-yard touchdown pass just before the half that sent Sunset into the break with a 30-7 lead. "We were just playing hard-nosed," Newcomb said. "We knew if it was third-and-short they were gonna try to pound it inside. We just went all out. If they made a play or two we didn't get too down on ourselves and responded positively." Sunset's front seven is the sort of unit that can stall out Jesuit's ground game if keeps up the disciplined, gritty sort of toughness it's played with the past three games. Newcomb, Nguamo, Williams, Nyembo, Connor Stevens, Ben McMillan, Taye Courtney and Gustavo Mendez make up a menacing defensive front that's making a huge difference in the win-loss column. "In practice, those guys scare the crud out of me," Craig said with a laugh. "But they make me better. When they're on the field, there's no doubt they can make something happen. If the offense isn't going our way, the defense can take care of it. That's reassuring for us." In the second quarter on 1 and 10 at the Apollo 37 the pigskin slipped right out Budke's untouched right hand and Stevens dove on the loose ball to give the ball back to Sunset with 4:30 left, still up 21-7. "We have great playmakers everywhere, but we have some dogs in our front seven that really like to get it done," Newcomb said. "We love setting the tone, hitting hard on that first play and keeping that same intensity the whole game." Craig not only made plays on the ground with his legs and in the passing game, but he also had a critical 38-yard coffin corner punt that pinned the Beavers at their own one-yard line late in the second quarter. The ball took a great bounce and Marchesi kept the ball from crossing the goal line. On the very next play from scrimmage, a low shotgun snap forced Budke to fall on the ball in the end zone and Williams jumped on top of him to get the safety with 23-7 with 2:02 to go in the first half. Devin Delgado's long kickoff return on the ensuing kick set up the Craig-to-Nyembo score heading into the half. 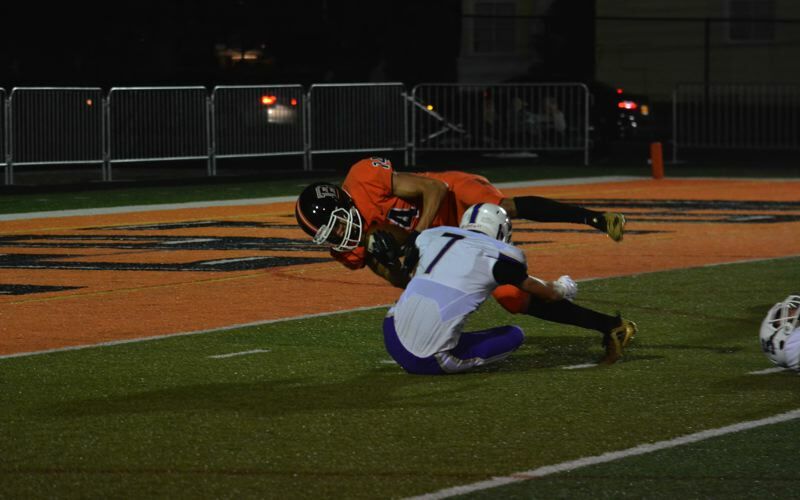 Craig tossed a picture-perfect fade route to only where Archibald could catch it and the Apollo receiver climbed the proverbial ladder in the left corner of the end zone and snagged the ball out of the air to go up 37-7 in the third quarter. Budke and Wilborn linked up for touchdowns of 40 and 35 yards in the fourth quarter. Williams and Kyle Sagon both scored touchdowns in the fourth and Hayden Skiba booted home a 37-yard field goal.